Install a high-quality picture window to transform your home. 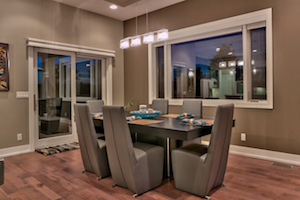 Picture windows provide a completely unobstructed view of the outdoors and bring natural light into your home. Picture windows cannot be opened, but will allow more natural light into your home. If you're looking to replace your old picture window or simply want a different look, the experts at Marshall Exteriors can install a replacement picture window in the material of your choice, including vinyl, wood and fiberglass. Contact us to schedule a free design consultation today! We provide free, no-obligation estimates for all window replacements in Fairport, Canandaigua, Geneva, Newark, Victor, Seneca Falls, Ontario, Farmington, Macedon, Waterloo and throughout New York. Call us or contact us online to get a free quote.